The idea of Happy Meals is to make the food appealing to kids, right? That explains the colorful packaging, the toys inside, and the very name of the meal itself. But a Canadian father has brought a class-action suit against McDonald’s, claiming the chain is illegally marketing Happy Meals to children. He’s basing the suit on the fact that Quebec has laws preventing companies from advertising to children under 13 via any type of media. 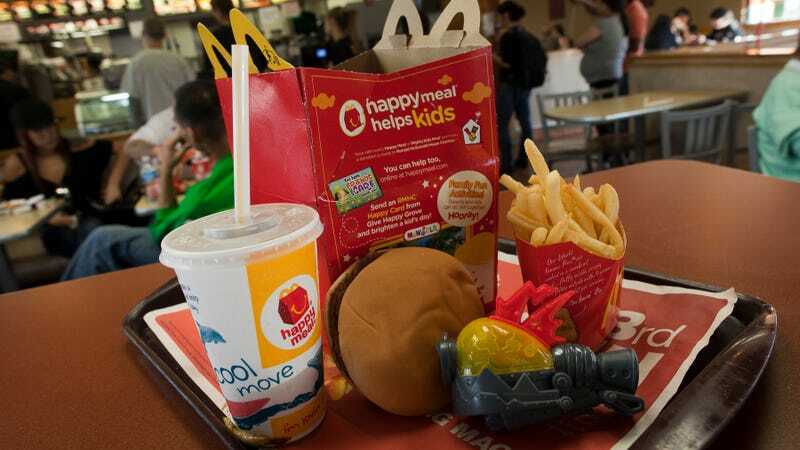 The father behind the lawsuit, Antonio Bramante, says Happy Meal toys, especially those tied in to popular movies, are a form of advertising to children. The BBC reports Bramante contends “children often want to return to the restaurant so they can complete their set of toys,” and that McDonald’s deliberately places the in-store toy displays at children’s eye level. Since 1980, the province has also restricted the marketing of unhealthy food to children. But there’s a question of whether Happy Meals would be considered unhealthy; in recent years, McDonald’s has made changes to the kids’ meals to reduce sodium, fat, and calories. The company removed cheeseburgers from U.S. Happy Meals, added bottled water as a beverage option for no extra charge, and removed artificial preservatives from its yogurt. There are exceptions to Quebec’s laws that McDonald’s could use in its defense. For example, companies are sometimes able to market to children “via store windows, displays, containers, packaging and labels.” But Bramante’s lawyer says none of these apply to the Happy Meal issue, and his class-action suit seeks both compensatory and punitive damages to discourage McDonald’s from continuing to market Happy Meals as it currently does. McDonald’s says the lawsuit is baseless. “We are aware of our obligations under Quebec’s advertising laws and reiterate that we do not believe this class action has merit,” the company told the BBC.